1. Peal & wash carrots and drain water. Wipe the water around carrots. 2. Cut carrots into small pieces. Put them in a vessel for mixing. 3. Now mix mustard seeds powder and red chilly powder, salt to carrots pieces. 4. In a pan fry cumin seeds and fenugreek seeds without oil till they become light red. 5. Grind them into fine powder and add them to carrot mixture. 6. In a pan put oil and fry ginger & garlic paste till water gets absorbed. 7. Keep this paste till it gets cool then mix this paste to carrot mixture. 8. For seasoning add oil to a pan and add cumin seeds, mustard seeds, curry leaves and asafoetida (hing). 9. Fry till cumin seeds split. Keep this seasoning till it gets cooled. 10. Mix this to carrot mixture. Now pour lemon juice to it, mix all. 11. Keep this pickle in a clean container and cap it. 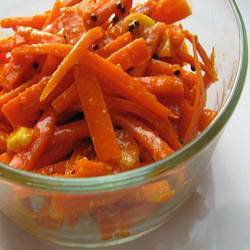 From the next day your carrot pickle is ready. 12. As days pass carrots pickle is good to taste. All content in this website including text and pictures is copyrighted to foodiblog.com. Powered by Blogger. This blog originated as a distraction: from work, from all tensions and from all liabilities. I think I'm a fair good cook. I'm absolutely starving to experience new ways of cooking. I want to travel the world and see whats cooking on other's mind. Feel free to follow along and read my astonishing cooking experiences.